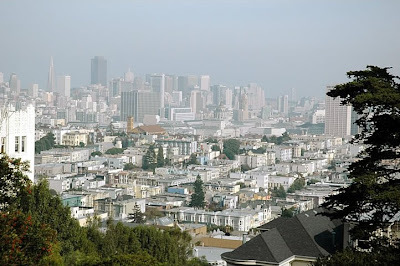 Taken from Buena Vista park, photo credit Urban. 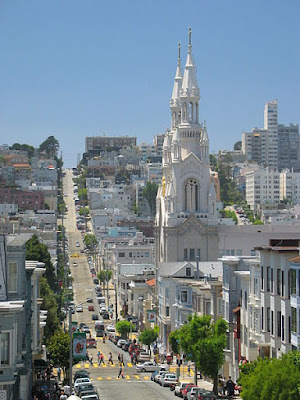 Filbert St, North Beach, San Francisco, CA, the church shown is the St. Peter and Paul church. I took a photo similar to this one on a cloudier day. Photo credit: Daniel Schwen. 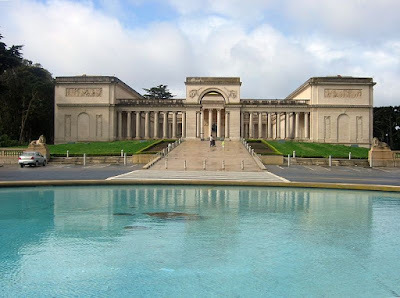 The Legion of Honor (or Palace of the Legion of Honor) is an art museum in San Francisco, CA. Current prices are about $12 per adult ticket, with members getting discounts. The De Young Asian art museum deservedly gets more attention. If you're a tourist, go to De Young, you can see old European art in any large American city and the Legion of Honor doesn't do it particularly well, but you won't find a whole museum devoted to Asian art many places in the U.S.. I guess if you're a tourist from Asia, then maybe the Legion of Honor is the better place. 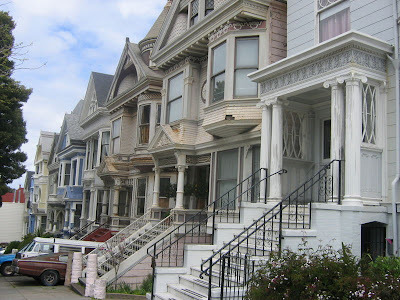 Victorian houses in Haight Ashbury (Haight Street between Masonic and Stanyan San Francisco)- it is not for hippies anymore. Photo by Urban.